The Hacienda San Agustin de Callo sits right beneath the Cotopaxi volcano! Its eight rooms on the slope, and individually styled and packed with character - expect fireplace, exposed stonework and murals. The hacienda has their own horses, and they’re right by the national park. 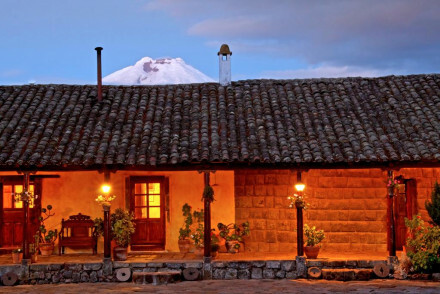 A charming Hacienda sitting beneath Cotopaxi volcano. Individually styled rooms are luxurious and packed full of character with fireplaces, warm hues, exposed stonework and the best feature murals. Keeping their own horses and with easy access to the national park this is a winning choice. Back to Nature - With views overlooking Cotopaxi and the national park just a short drive away find easy access to the great outdoors. Local markets - The hotel offers a number of excursions to local village markets.